On Monday, Conversion Sciences launched a revamped website. As you will learn in our Lab Coat Lessons Webinar, a website redesign can be a very dangerous undertaking. Sixty percent of our business comes through our website (the remainder being referrals). 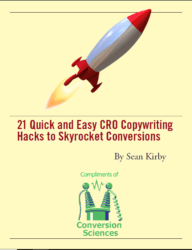 Any significant drop in traffic or conversion rate will hit our bottom line hard. It’s still early for us, but we will share five client redesigns we’ve been involved with and why they were or were not successful. Watch the webinar replay. There is a lot that can change in a redesign. The sentiment seems to be that, since everything is changing anyway, what can it hurt to add a few more modifications, updates and rewrites? It can hurt a lot, as it turns out. A redesign is a collection of changes, all based on assumptions about what visitors want. Some of those assumptions will be right on. Some will be sadly misdirected. The more you add, the more likely you are to introduce some random poison pill feature into the mix. Any website redesign is a mix of good and bad assumptions. With our redesign, we did the opposite. Our primary goal was to improve the search engine performance of our amazing content (like this). We were tempted to rewrite dated pages, redesign elements we’ve grown tired of and photoshop our pictures to make us look more fit. We will do these things, but not until we’ve baselined the structural changes we launched on Monday. 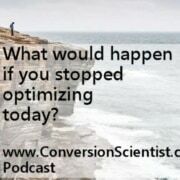 The heartbreak comes when more of your changes decrease conversions than increase them. Things can get ugly when more of your redesign ideas hurt than they help. If you didn’t roll out changes step-by-step, you just don’t know which changes hurt you and which helped. 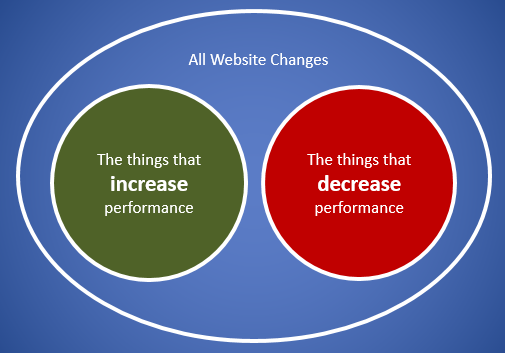 An even more insidious result is when more of your changes increased performance. In this situation, the marketing department pats itself on the back and goes on about its business. When the good decisions outweigh the bad, the bad decisions are hidden. But how much better could business be if the bad decisions were tested away? Usually, much better. The positive decisions overshadow the mistakes that still linger on the site sucking the revenue out of the business. JJ Abrams has shown that he can revitalize a beloved film franchise, turning it into a blockbuster. Isn’t this what you want for your website? Find out how he did it in our webinar, The JJ Abrams School of Website Redesign. We’ll show you five different approaches to data-driven redesign. One should fit your situation. I’ll write more about what we’re learning from our redesign. I tried to get through this podcast because the information was really helpful but I just couldnt stand the audio quality, it sounds like its being streamed through a 56k modem. Also one quick question as I was surprised about your reasons as to why you should redesign a site. You say if it looks outdated then that not a god enough reason to redesign. But wouldnt an outdated site put people off from buying a product or service? I know it certainly would with me. Paul, the audio quality is attrocious. GotoWebinar has proven to be unreliable on Mac computers even though they have great features. Good question about an “outdated” site. What looks outdated to you may look familiar to your visitors. Rather than redesign, we recommend testing into a new design (like the last case study, which you probably didn’t make it to). Sure, your outdated site might convert better with a new design, but you might destroy your conversion rate if you change everything all at once and push it out. Are the Zooms still the state of the art in Podcasting? I’ve got a Sony digital recorder and Ars Technica lapel mic.